Overnight lows may have dropped from the double-digits to the single digits over the last few weeks, but don’t let a bit of concern over temperatures have too much impact on your plan for your canola. If your canola is below 20% moisture and the temperature doesn’t drop too low, it will still be okay. Plus, you would have to swath at least 3 days before the frost to have an impact, so usually it isn’t the best choice to rush your harvest plans. A general rule of thumb is that 30% SCC on the main stem equates very roughly to 30% moisture content. For every 10% increase in SCC, the seed moisture content will drop about 5%. As the crop matures from 30 to 40% SCC, the moisture will likely have dropped to approximately 25%. Once you are at 50% SCC or more, the crop should be at 20% moisture content or less. Consider these 4 frost-related scenarios which consider both the crops stage and minimum temperature reached. Crop is past 30% seed colour change (SCC) on the main stem, plants have relatively few side branches, and heavy frost is forecast. This is not the ideal SCC for yield, but at 30% SCC, most of the seeds will be firm to roll. You may want to consider cutting this ahead of the frost to prevent locking in green on the most immature seeds. Note, however, that the crop needs to dry down to a seed moisture level of 20% or less to be relatively safe from the damaging effects of frost. This can take three good drying days, so swathing has to occur at least three days before the frost to achieve this benefit. Crop is past 30% SCC, green seeds are firm to roll, and light frost is forecast. The degree of frost is hard to predict, so will a light frost really be light? That is a question we can’t answer here, but going on the gut feeling that frost will be light, leave this crop standing. It would have to be cut about three days before the frost to get pods dried enough to keep them from popping open. Crop is at 5% SCC and heavy frost is forecast. At 5% SCC on the main stem, this crop is really green and a heavy frost will bring high yield loss and lock in high amounts of green for those seeds that do make it to the combine hopper. The best option is probably to leave it standing and take your chances that the frost is light and the crop will have a few more days to mature. Each additional day standing will benefit this crop. 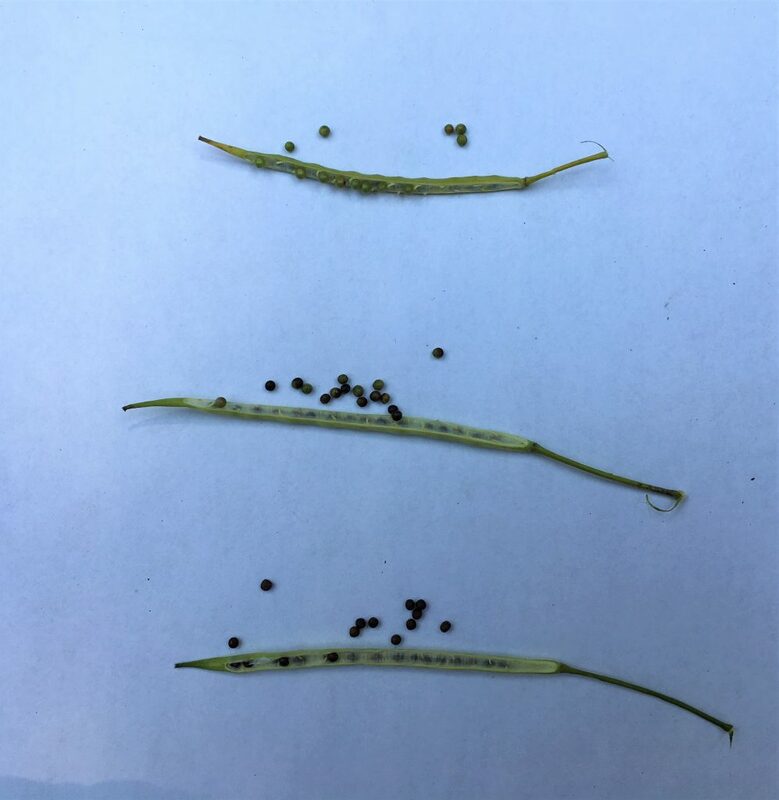 Research conducted by the Canola Council of Canada over approximately 28 site-years indicates that significant yield increases could be achieved by swathing at 60-70% seed colour change (SCC). Swathing at 60% SCC resulted in 8% more yield (which was equivalent to about 3 bu./ac.) than at 30-40% SCC, 12% more yield than at 10-20% SCC, and 19% more yield than swathing before 10% SCC. Swathing at 5% SCC in anticipation of the frost could reduce yields by 20% or more. This crop will benefit from all the standing time it can get. Wait out the frost, but monitor afterwards to assess the degree of pod damage and increased risk of shelling if left standing after a harder frost than expected.